I have been an Opera user (mini at first) since 2006, and always pleased to see my favourite browser being continuously improved. And the news of all new Opera browser for android and switch from the proprietary rendering engine 'presto' to a WebKit rendering engine brought a quite joy to my heart. 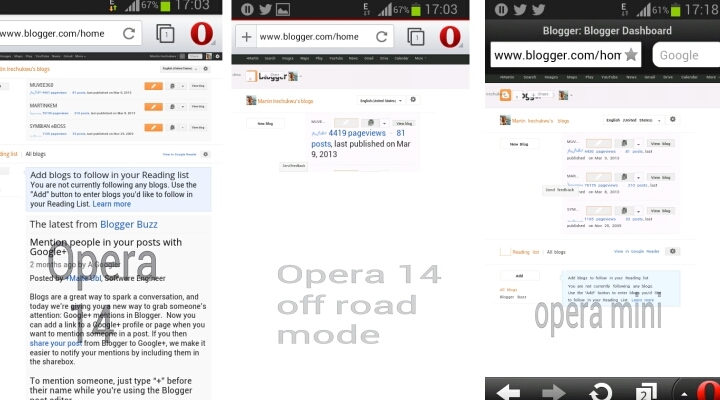 The new Opera browser sports a cleaner interface which makes the webpage the center of all attraction. And puts all the controls at the top alongside the address bar. The pages renders just as well and as fast as Google chrome (25) for android. 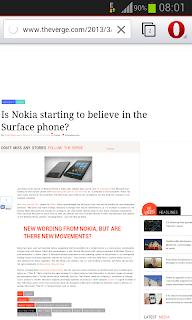 The only issue i had was with the text reflow, most mobile browser would arrange the text to fit the screen on zooming. But the Opera browser didn't do this. Tab switching is also kinda reminiscent of Google Chrome and is accessed by a tab button in the top bar. But instead of stacking the tabs as cards like Chrome, it shows them as horizontal side by side cards. 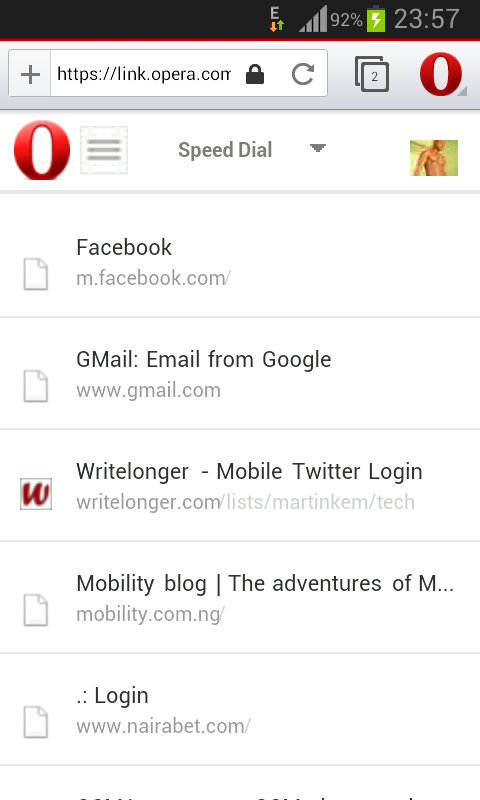 And closing open tabs is achieving by clicking on an 'x' button, while in Google chrome, one can swipe away the cards. 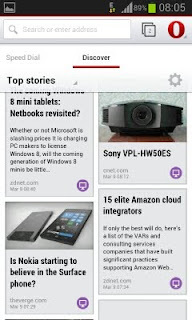 Opera browser 14 introduces a Discover page which acts as a news aggregator in a clean touch optimized way (a la Flipboard). Opera Link in Opera Browser 14 has been depreciated and acts like a webpage hosting all my bookmarks, instead of storing my bookmarks locally. This makes accessing them very cumbersome. 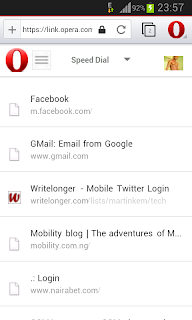 And typing into the address bar didnt bring up suggestions from my Opera link bookmarks. The normal Opera speed dial also takes a tumble, usually it should have been synced through Opera link but it doesn't do that. My speed dial bookmarks are only accessible from the Opera Link webpage in settings. 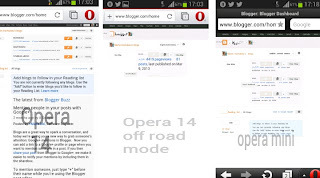 Overall I liked the Opera browser, before now I usually had the Opera mobile and Opera mini on my phone but with this new browser I won't be needing the two anymore, as i could easily get Opera mini data savings by just toggling off-road mode on and off again. And no more switching to Google Chrome to visit some websites as Opera now uses WebKit too and is more than capable of loading any website quuckly. Speed dials should be my regular favourites from Opera link. Since the Opera browser is still in its beta stage I guess these features might be added later before it gets to the stable version.